Self-Portrait, Plates/Teller No.75, 2016©Juergen Teller, 2017. All rights reserved. Lead ImageSelf-Portrait, Plates/Teller No.75, 2016©Juergen Teller, 2017. All rights reserved. 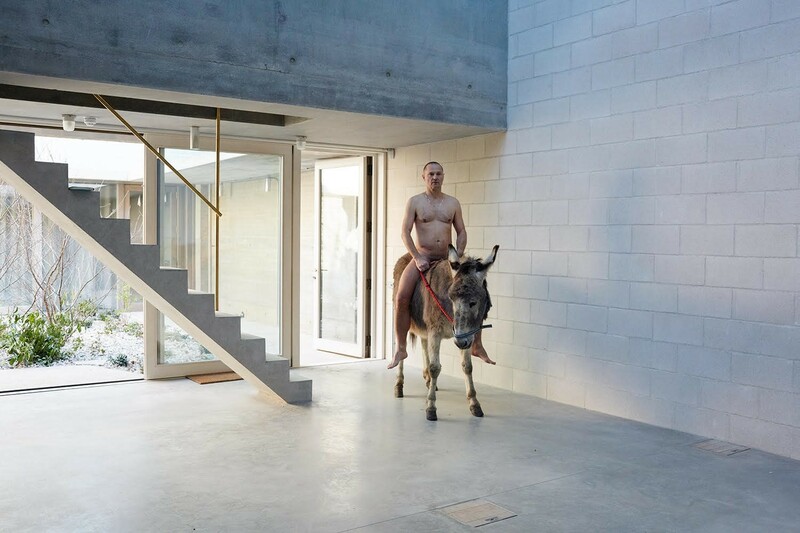 Famed for blurring the boundaries between art and fashion, photographer Juergen Teller has been responsible for some of the most iconic fashion imagery of the last two decades, transforming the energy and feel of fashion campaigns indelibly. Having worked with Vivienne Westwood and Andreas Kronthaler for more than ten years, he has helped create one of the most spacious and stimulating identities a brand today can have. A 30-page portfolio in AnOther Magazine Autumn/Winter 2017 examines the impact of pioneers Westwood and Andreas Kronthaler, and would be incomplete without the voices of their key collaborators. This interview with Juergen Teller is one of a series of discussions outlining the bold and brilliant world of Westwood. AnOther Magazine: You’ve just celebrated ten years of working with Vivienne and Andreas in an exhibition at their New York showroom, would you say that there’s a shared ethos or spirit of some kind? Juergen Teller: Well, kind of, completely. Every time I’ve worked with them I’ve really enjoyed it, it’s really exciting. I find it super interesting and easy. We understand each other very well, Vivienne, Andreas and me. It’s really easy with us. We like the same things. And there’s never, ever, ever a disagreement or argument. When something doesn’t work, we both think it doesn’t work. And when something works, everybody thinks it’s great, and it works. So it’s really great. There’s a total trust there between all of us. And we just use ourselves. And I think the bottom line is to have fun together and do things together. And their clothes inspire me. They have an extremely good eye for casting too. And sometimes I bring in people which they then agree on and find inspiring and exciting and it’s just fun really. It’s something I really look forward to. And Vivienne is such an inspiring soul. The way she looks and everything. What she stands for and what she did in her life for all these years. And she always recognises herself in the pictures. There’s a complete trust there. So that gives me a kind of openness to try things out or do things. AM: And how did that all begin? How did your relationship with them start? How did you start working with them? JT: I think I first started working with them... maybe 25 years ago when I photographed her first. That was a portrait for French Vogue. It was one of my first commissions for them. It was a black and white picture and she sits on a park bench and she said it was one of the sexiest pictures anybody had ever taken of her at that time. And then we became friends and worked together once in a while for a magazine and bumped into each other from time to time. One day, i-D magazine asked me to photograph Vivienne and Andreas together with one of her muses, Sara Stockbridge. And then, I went to their house and it was just a lovely day photographing them. It was a really nice house they live in. And that was really the beginning. I said, “I think, if you want me to do the campaign you both should be in it, because you are both the best spokespeople for it. You wear the clothes fantastically well. You both should be in it!” And then Vivienne’s response was: “What a great idea! Because that’s going to be cheaper!” [laughs] So that was the beginning. AM: And what was your first impression of her and Andreas? JT: Very positive. I must have met Vivienne before Vivienne even met Andreas. Because they’ve not known each other for 25 years. I’m not quite sure. But let’s put it this way, I don’t remember Andreas being around at that time. Maybe he was... but it was just her. And it’s very very lovely because I come from Bavaria and he’s from Austria so it’s not that far away so we speak very happily in our Austrian-Bavarian with a German accent. And I used to have this working relationship – well, I’m still a close friend of his – with Helmut Lang who’s also Austrian and that doesn’t really happen so often in the fashion world or the fashion industry, to have German designers and German photographers doing something together. So from that level it was always easy and pleasant, you know, to share the same language. AM: And how would you describe their approach together? How does their relationship affect the dynamic on set or coming up with the ideas for the campaigns? JT: I guess the big difference is: they are their own boss, they don’t have somebody looking over and saying something. They don’t have to talk to their CEO. They can do whatever they want. You know, I think that is the big, big difference and that’s what I think is their greatest strength when working with me. So we can just decide on the day, all they want and what to do with the layout and anything else. There’s a big difference – that’s how the fashion industry has changed a lot. It’s still an independent company. AM: So do you feel a lot of freedom when you are working together? JT: Completely, yes. You know, I can’t photograph a camel: I have to photograph the clothes, and then the handbags, but how we do it is up to us. AM: Do you think that is entirely related to the brand’s success? That sense of separation from everyone else? JT: No they always had this – it’s the same with me – they always take this sense of freedom, engagement with, and attitude towards what we think is best for each scenario. I think if they were at the beginning, and just starting, they would have just the same attitude. Even if they weren’t successful they would start well and wouldn’t have changed. I think that’s what it always was: this kind of confidence of doing what they believe in and not compromising, and I think that’s strong and very similar to me. I think that’s the similarity between us. AM: And when you set out to do a campaign shoot, do you have any pursuit in mind? Or do you very much roll with whatever is happening? JT: You aim to get the spirit of them right. That’s the aim, that’s all there is, and to capture my spirit. And it really varies. Sometimes we shoot here in the studio, sometimes we go to Heathrow, sometimes we go to Malibu for Pamela Anderson – depending on the idea really. AM: Today if you’re setting out to do a campaign, do you have the same approach? Has it changed in ten years? JT: No it hasn’t changed. And it never got boring like, “Oh God, we’ve got to do this again”. It’s always quite exciting. And it’s also just nice spending time with them. I always treasure that. They come over to my studio now and come for lunch to the meetings and talk about other things – about the world of fashion, of politics. It’s very nice. AM: Obviously your photographs of Vivienne naked caught a lot of attention. Did that change anything in your working relationship? Or did it feel very natural, a normal part of the narrative? JT: No it didn’t change anything for us. It was just something I was very much interested in doing it because I’ve been photographing her for so many years and all these different collections and always found her incredibly beautiful. Her skin… you know, just the way she looks – when she had her orange hair and her white skin – and she’s such a good-looking, proud, mature woman. I had an interesting idea to photograph her naked because I haven’t photographed anyone her age naked. It was a kind of experiment I wanted to do. And it was very successful. AM: Was she trying to achieve something specific? JT: No – she was perplexed about it. She was like “Oh my god I’ve never thought about that”. And then she said “Why not? Let’s do it! I trust you completely. I’m actually curious how I would look.” And then, the best, best, best place to do that was her house... It was on a Sunday at some point, in the afternoon. AM: And do you have any favorite shoots, trips or images from any of your campaigns? Any that particularly stick out? JT: Not really. We’ve just started to look through those ten years of campaigns – which is 20 shoots – and there’s always something which you think, “Oh my god, that’s good, and that’s good, and this will work.” When we went together to Africa that was very, very exciting and with a company she works with called ITC [International Trade Centre], who work with traders in third world countries. Vivienne and the company work with accessories makers there so we shot in the workshops and they showed us around and we just took some interesting pictures – it was very exciting and partly dangerous too. JT: Because we photographed in the slums and that wasn’t so easy. Well we had people to help us there and it was all good. But I kind of felt like we had the protection of Vivienne herself. You know in a ballgown or some sort of elaborate outfit with her orange hair and her white skin. It was so abstract and extreme for the locals that they were more interested in watching us than robbing us. They’ve never seen anything like it! They thought that some strange alien had dropped into their slums and that was Vivienne. They’d never seen anything like it. AM: How do you approach the casting? How did Pamela Anderson get involved? JT: Pamela was a friend of theirs, and then they just suggested it to me. I thought she was a great idea. It varies: sometimes it’s a friend of mine or someone I worked with before. But also they do a casting for each of their shows and they’ve got quite big a fan club, lots of followers and clients, and that all comes across. AM: And obviously you work across both commercial and the art worlds. And Vivienne also bridges activism and fashion – does that duality appeal to you in any way? JT: Yes of course. You know, I would be bored just being a fashion photographer. AM: Do you feel that you have that in common with Vivienne? AM: And do you think that blend is important? Do you think one helps the other? JT: It’s important just for us to be interested in different things. Of course. It might not be interesting for other people and they might be happy doing their one thing. It’s important to be involved in different things for me.